Pictured are Gallco PALS as part of a self-protection and awareness presentation with Southern Ohio Krav Maga’s Scott King. GALLIPOLIS — PALS Gallia County and Southern Ohio Krav Maga held a self-protection and awareness demonstration Friday afternoon in order to introduce PALS clients to techniques and information designed to both inform and guard them from individuals who might take advantage of them. A customized program both King and Price discussed was aimed at educating clients in knowing when they were being taken advantage of, handling bullies and what to do in emergency situations, along with some defensive techniques. “He’s teaching them to be assertive and advocate for themselves,” said Price. King at one point in the demonstration would use the example of asking to see someone’s cell phone and then walk off with it. He asked the crowd if that was appropriate behavior. Clients responded no and King told them they were right. If someone was attempting to walk off with their property, they should tell someone to stop. King encouraged clients that the best way to avoid trouble was to not be there and to walk or run from it. “It’s about helping learn where boundaries are,” said Price. Price said King would return again for another session with the clients as they looked forward to the classes. 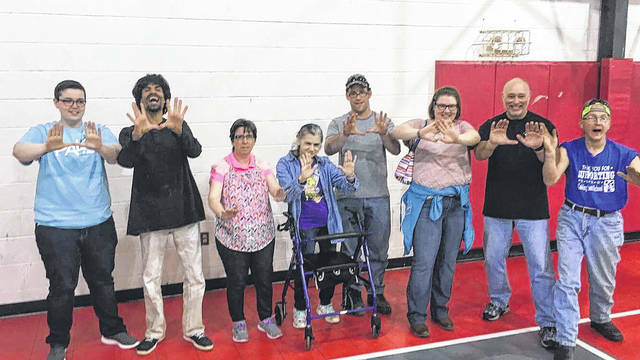 PALS Gallia seeks to serve clients with developmental disabilities and introduce them to a life of independence and equality as they interact with the community in the everyday.